"Wondering" is on hold. West Papua tribes are rebelling and seeking independence and the Bower Birds will have to wait. Hopefully the children of Hungku will care for them. An author from Maine is writing a children's book about them. Perhaps it can be translated into Indonesian and even Soab, the local language. Moving on I have turned to fish. My father loved fishing and my first print was for him, a rainbow trout. Now it is koi, bass, herring, sardines and a whole Jimbardin Bay series from Indonesia which will be shown in Spring 2012 at Christopher Brodigan Gallery at the Groton School in Groton, Massachusetts. 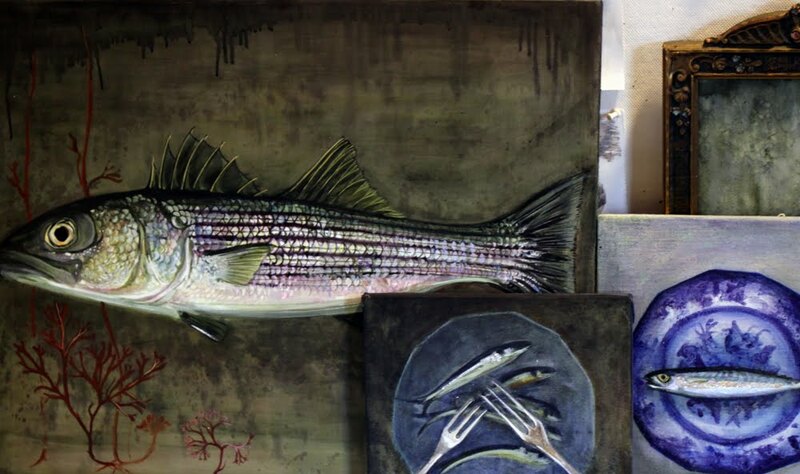 "Alewife" and "Sardines" recently sold at the Frying Pan Gallery in Wellfleet, Massachusetts. "Koi" prints were sold to the Keys Gallery in New York City. Ditto press in Concord, New Hampshire is in the process of capturing High resolution prints on German Etching of four feather prints. This is inspired by the sale of eight originals to the well known Robert McKracken Peck of Philadelphia. He has just curated a show on Edward Lear's feathers for Harvard University in Cambridge, Massachusetts to open in spring of 2012. These sales are wonderful and encouraging but cannot help the Bower Bird. It is good to have a record of their creations. Visits from my grandchildren in July added fun and enthusiasm. Moments with Michae l(age 10) at the Koi pool at the Peabody - Essex museum in Salem, Massachusetts inspired en caustics and a trip for him to Skip Seiglers fishing expedition(www.striper.com) His catch can be added to the help of John Michael La Dodge of Hollywood, California and Tristan Howard of Portland, Maine and Skip Seiglers of Marblehead who has given me fillets, heads, tails, and skins of stripers, mackerel, and herring. Michael made a nice slide show of my birds and granddaughter Cinnamon(age 6) made a video of her sister Willow(age 4) in my gallery. It can be seen on Youtube "Willow at Joey's House". Today I am doing my version of a large salmon head. Wonderful black markings!